Lighting designer Richard Locklin has over 30 years of experience lighting the likes of Little Feat, Sting, Bob Dylan and many other top music industry names. Most recently he designed the lighting for Paul Simon’s “Graceland 25th Anniversary” tour and was one of the first LDs worldwide to use Martin Professional’s award-winning MAC Viper Profile. Lighting vendor Neg Earth supplied 20 of the new 1000-watt profile fixtures along with Martin MAC Auras for a European leg in July. Richard bottom-hung the 20 fixtures on the truss with one fixture top-hung with pan/tilt disconnected. Working with the truss operator, he used that fixture as a rear light onto Paul Simon. “This way I had full control of the truss spot and it was consistent with the rig,” he says. The MAC Viper Profile is the first fixture in Martin’s 1000-watt MAC Viper family of automated luminaires and is quickly finding a spot on riders across the touring industry. It won an Award for Innovation at the recent PLASA trade show in London where it was hailed as “a new benchmark for automated lighting spots." 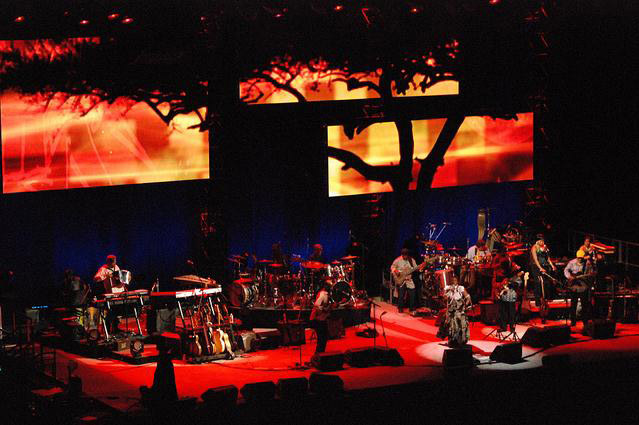 The Paul Simon tour was a special outing that saw the multi-talented musician perform the Grammy Award-winning Album of the Year in its entirety. Richard acknowledges Martin’s Jeff Washburn, Christopher Merriman, programmer Lawrence Stromski, Neg Earth Crew Chief Darragh McAuliffe, and crew Miec Hagget and Hayden 'Goaty' Corps for their excellent work and assistance.